Participants represented the pueblos of Santo Domingo, Acoma, Santa Ana and Taos, the Navajo Nation and the Iroquois Confederacy. Over the three days, Keith Strever and John Stokes presented a program filled with discussions and activities—the Thanksgiving Address, Secrets of Natural Movement, self-defense, storytelling, education ideas from the elders of Australia, Hawai‘i, Brazil and North America, the importance of the indigenous perspective… and touched on such traditional skills as firemaking, cordage, traditional navigation/wayfinding, qigong and self-healing. Randy and Ian, old friends of our Project through their spiritual elder, Mohawk leader Tom Porter, did a great job of organizing this training. Partnering up for arnis training, NIYLP staff retreat, Oso Vista, May 2009. Photo by India Stokes. Kate Brown, Ben Soce and others in the Gallup office of NIYLP helped to coordinate this two-day training near El Morro, which was attended by 20 young Native trainers. The timing of this event offered a few days of relaxed training and self-renewal for the staff just prior to their demanding summer schedule and national camp in July. Over the two days we were able to cover activities and discussions that included: the core Tracking Project program, notes on sustainability, leadership principles, internal tracking, dreamwork, and the importance of traditional subsistence skills. For the tracking outing on the second day, we were joined by old friends Dave and Effie Martine from Ramah. Thanks to Mac Hall, Kate, Ben, Devin Seowtewa (Zuni) and others, John and Kainoa Stokes were able to join close to 100 youth and adults at NIYLP’s national camp. 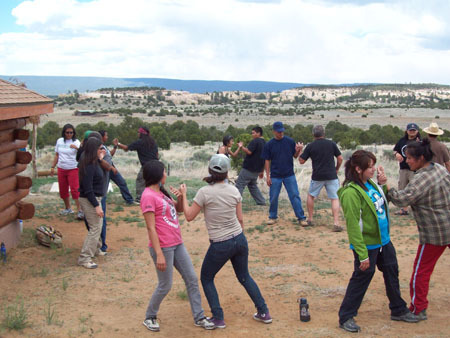 Our connection with the staff from the May retreat allowed us to move easily from activity to activity, presenting our Tracking Project program to the youth who represented Native communities from North America and Hawai‘i. Kainoa did a great job assisting the teaching of the arnis and self-defense. In the Turtle Mound one evening, Ben, Devin and John made a hand drill fire for the community which they then used to light two larger fires to illuminate the evening’s program of music and stories by John and Dave Martine. We have been very impressed by the competency, drive and enthusiasm of the young Native trainers that we worked with this year. Blessings to all the people who made these outings possible.